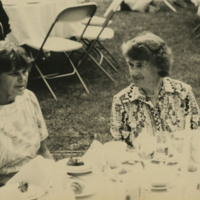 Photograph of two reunion attendees, seated at a table out on the lawn. 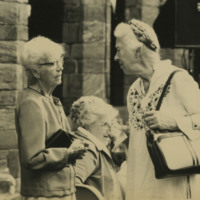 Photograph of several reunion attendees talking to one another, standing and outside, with others looking on in the background. 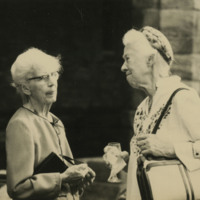 Inscription on back states "from the papers of Mary Helen MacCoy '00." 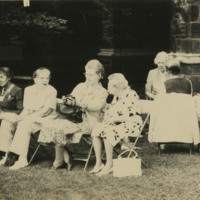 Photograph of reunion attendees sitting on metal folding chairs on the lawn. One of them is holding a camera and a handbag is placed on her lap while another handbag is placed on the grass. 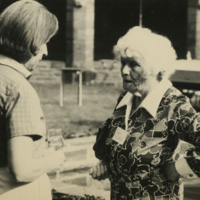 Photograph of a reunion attendee talking with a younger woman (possibly a staff member) who is holding what appears to be a glass of wine. 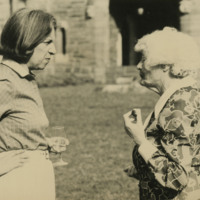 Both are standing on the lawn. 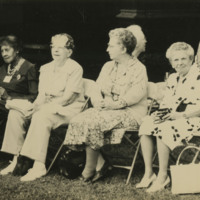 Photograph of reunion attendees sitting on metal folding chairs on the lawn. One of them is holding a camera and a handbag is placed on the grass. 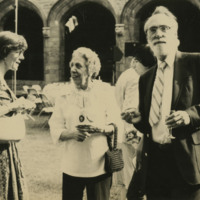 Photograph of several reunion attendees in the background and a man in the foreground with a glass of wine. They are all out on the lawn. 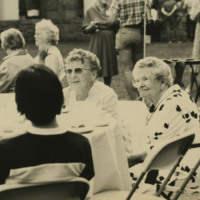 Photograph of several reunion attendees sitting at a table in folding chairs and speaking to younger women (perhaps students?). 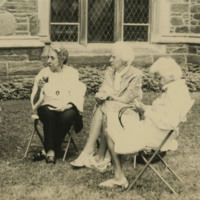 Photograph of three reunion attendees, seated on the lawn in metal folding chairs, with two other attendees (one seated, one sanding) visible at the left-hand edge of the photo.